Laminar flow hoods maintain a controlled work surface for applications needing the absence of particulate contamination. These hoods eliminate contamination by producing a constant airflow across the surface. Laminar literally means of a flow" or taking place along constant streamlines, without turbulence. Simply put, laminar flow hoods provide air streams that travel in the same direction and at the same speed. This eliminates any air flow swirls that may cause random and uncontrolled results. Laminar flow hood availability spans two main categories - horizontal and vertical. As the name implies, horizontal laminar flow hoods present airflow in a horizontal direction, while vertical laminar flow hoods provide a downward vertical flow. And while you may know you need a laminar flow hood, knowing which laminar flow hood to choose can be difficult. Thankfully, because there are unique benefits associated with each one, a closer look can make the choice clear. 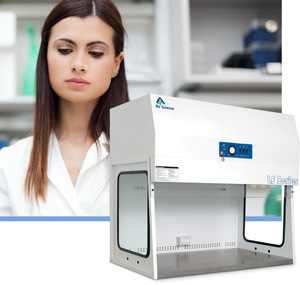 Your application requires less turbulence on the work surface - While both horizontal and vertical produce very little turbulence, horizontal may render slightly less as the airflow does not hit any obstruction until exiting the fume hood (as opposed to the vertical flow hitting the bottom of the unit). You will be using primarily small utensils and equipment that will not cause airflow disturbance - Large equipment within the path of horizontal airflow may cause greater turbulence. You need the most control over contamination - Hands and gloves are positioned downstream of the sample in a horizontal flow, therefore greater contamination protection is possible with horizontal laminar flow. Your application necessitates large equipment be used on the work surface - Vertical flow does not produce as much turbulence when hitting large items within the flow, as opposed to the disturbance created in a horizontal flow. Your application requires that soldering fumes or fine powders be used - Soldering vapors can be toxic due to the presence of metal oxides and acidic fumes from flux. Only use laminar flow hoods for handling non-hazardous powders or nuisance odors being generated on the work surface. You need a taller, larger work space - Because the filters are generally positioned on top of a vertical laminar flow hood, there is greater height available for work surface. Air Science offers both vertical and horizontal laminar flow hoods with easy-to-change filters, customizable options and personal sales advice throughout the decision process. Make sure you get the best fit for your application by talking to one of our experienced sales team members.